Today we have two torus knot conformations of 7_1. A torus knot is one that can be drawn on the surface of torus ("inner tube" shape) without intersecting itself. A T(p,q) torus knot wraps around the torus like a clock p times, and around the handle of the torus q times. The standard conformation of 7_1 in the knot table is shown on the left, in the form of a T(2,7) torus knot. The blue conformation on the right is the same knot but in the T(7,2) torus knot conformation. Settings: Printed on a MakerBot Replicator 2 with our custom knot slicing settings to minimize supports. Printing the knot on its side results in far, far less support material than printing knot horizontally. 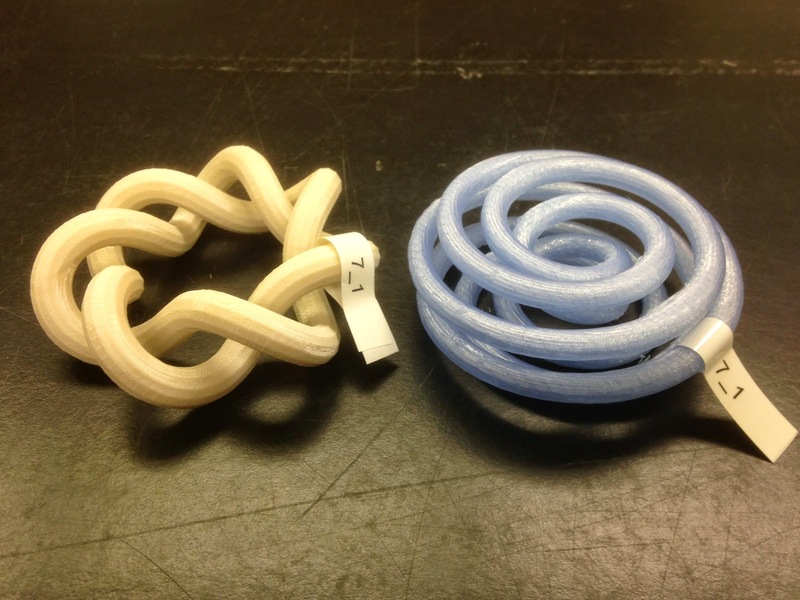 Technical notes, OpenSCAD flavor: This knot was printed by JMU student Taylor Meador, who used a modified version of the OpenSCAD code for our trefoil torus knot models from Day 150 (thanks as always to kitwallace).